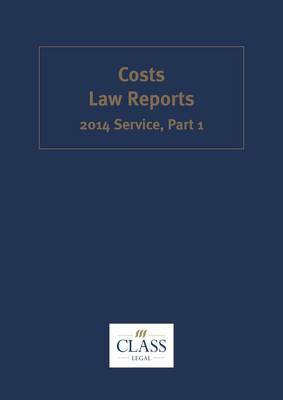 Costs Law Reports is the one authoritative source of costs law reporting. It includes important criminal decisions of Costs Judges, many of which are not available elsewhere. Cases in this issue: Wyche v Careforce Group plc; Lord Chancellor v Ahmed; Tuckers Solicitors v Lord Chancellor; Forstater and Another v Python (Monty) Pictures Ltd and Another; Rayner v Lord Chancellor; Adlington and Others v ELS International Lawyers LLP; Durrant v Chief Constable of Avon & Somerset Constabulary; Karbhari v Ahmed; Thevarajah v Riordan and Others; Webb Resolutions Ltd v E-Surv Ltd; R v Osoteko; and R v Garness. Topics covered in these cases include: CCTV footage, classification of offences, conditional fee agreements, conflicts of interest, costs budgeting, costs protection, delay, disclosure, extensions of time, funding orders, notices of funding, pages of prosecution evidence, permission to appeal, public funding, relief from sanctions, representation orders, special preparation, strike-out, time limits, transfer of cases, unless orders, and witness statements.